While on our anniversary trip to northern Pennsylvania last year, Joan and I made an exciting find1 within a cobweb-filled garage that sat behind a damp and mildewy antique store in Coudersport, Pennsylvania: A thick stack of 1954 freight waybills from the Coudersport and Port Allegany Railroad Company. The C&PA operated in Potter and McKean counties from 1882 until 1964, when it was purchased by another railroad, only to be abandoned in 1970. 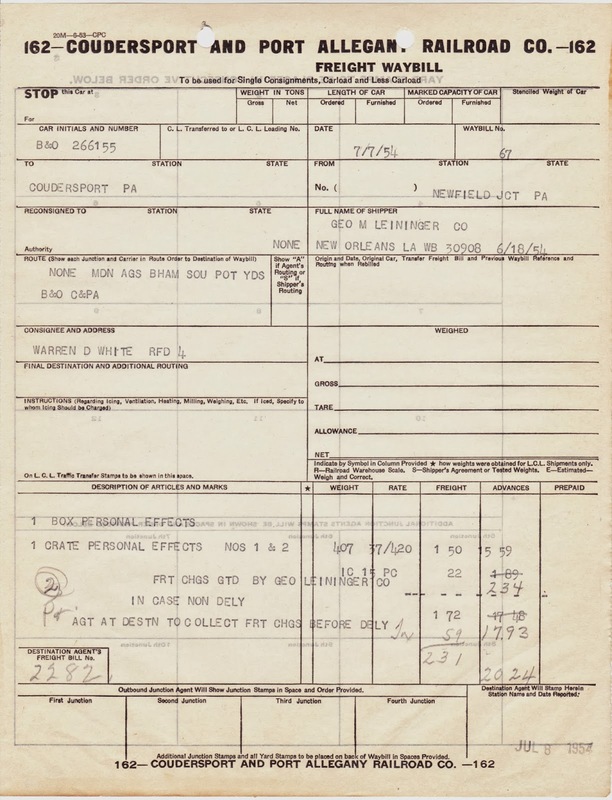 The waybills document the shipper, consignee and goods for all freight shipped by the railroad. These receipts from 60 years ago provide an interesting snapshot of what was being moved across this less-than-20-mile line in northcentral Pennsylvania at the time. From Lachman Rose Co. to Transogram Co.: 1 container "toys plastic damaged"
1. Full disclosure: OK, I was excited by the find. I think Joan was a bit creeped out and worried that I would not make it out of the cavernous garage, in which years worth of junk tottered in precarious piles, alive.